Metalcraft flower vases are available in a variety of designs and sizes, each as stylish and elegant as the next. They are as strong as they are beautiful, thanks to the die-cast aluminum construction and exclusive coating process which adds exterior durability without compromising beauty. It is this commitment to quality and a dedicated craftsmanship that makes Metalcraft vases stand out among all others. 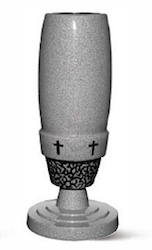 All Metalcraft vases can be securely mounted to an upright memorial by any of the four available fastener options. 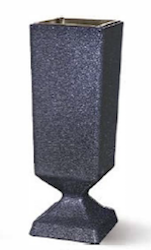 In addition, many of the vase designs are offered in the Flush Ground Unit System which provides a convenient way to meet cemetery maintenance regulations. The patented Cor-Loc* System was specifically created as a mounting device to attach the ground unit's ring and canister to a grass marker. 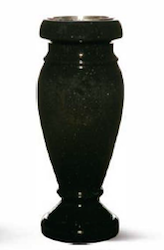 Review all of our upright vase designs, and the ones available in the flush ground units at www.USMetaJcraft.com. 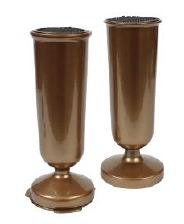 For special vertical applications, Metalcraft has a number of vases to meet your needs. 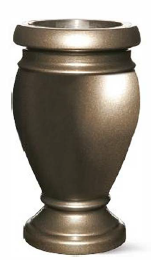 Whether it is a shutter front or the back of a slant memorial, all of our wall vases can be attached to create a distinct appearance, setting it apart from other memorials.